No matter if you are at the circuit or watching the races from TV. 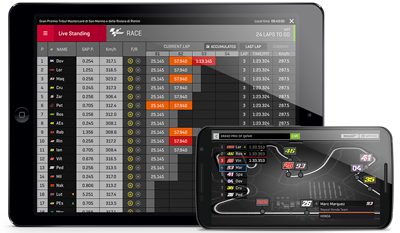 Get your TIMINGPASS and enjoy the most detailed analysis tool ever provided in MotoGP™. TIMINGPASS is the only package that provides Audio, Timing & 3D Tracking of each session of the MotoGP™ World Championship. All available Live & OnDemand. Use your motogp.com account and get access via your smartphone, tablet, PC or Mac.